Researchers at the National University of Singapore have built a beam of darkness that can make objects invisible from a long distance away. This isn’t the plot from some not so distant sci-fi movie: It really works. The beam of darkness can create a 3D region of invisibility or “empty light capsule” as the researchers call it that can hide macroscopic objects. The darkness beam, developed by Chao Wan and fellow researchers in Singapore, creates invisibility in a fundamentally different way to the invisibility cloaks that we usually cover on ExtremeTech. For the most part, the bleeding edge of invisibility cloak tech consists of a metamaterial enclosure that bends radiation (microwaves, not light) around an object. If we could build large, flexible, and lightweight invisibility cloaks of metamaterials, that’d be cool but sadly, we’re years and years away from such an invention. For now, metamaterial invisibility cloaks are mostly limited to a single dimension and a narrow range of radiation frequencies and, as we’ve covered before, due to the cloak’s clunky physical dimensions, most of these cloaks actually increase the RF footprint of an object due to scattering of radiation that isn’t picked up by the metamaterial. 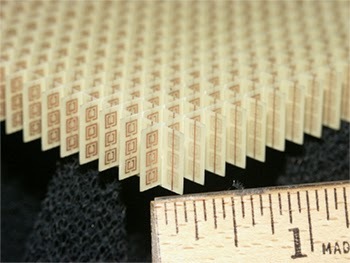 This is what a metamaterial looks like. It is hard to make a cloak out of this stuff. To create a region of invisibility, Wan and co use an entirely novel technique that we believe is the first of its kind. I’ll try to explain it, without wading too far into the physics of it all. As you know, when something is completely in focus, it is bright and sharp with well-defined edges. When it’s out of focus, the middle is still bright, but the edge is soft and undefined. The governing rule behind this effect is the point spread function (PSF), which creates a very characteristic graph if you plot it (pictured below on the far left) a tall middle spike (the bright, sharp region of the image) with two lobes either side (the blurry region). On a macroscopic scale, it isn’t hard to focus on things but for microscopy, the resolution of the system is defined by how well it can control the PSF for very small objects as the middle spike decreases in size, the resolution of the system decreases. Recently, a new technique called super-resolution can increase the intensity of that central spike, while suppressing the outer lobes. This allows for an increase in resolution and the resolving of even smaller details. The Singaporean researchers, in essence, take super-resolution and do the exact opposite. By using special lenses, the researchers smear out the spike, while at the same time increasing the intensity of the lobes. This effectively creates a region of space where the intensity of light is close to zero and if there’s no light, nothing can be resolved. Voilà: an empty light capsule of invisibility, or as the researchers call it, anti-resolution. 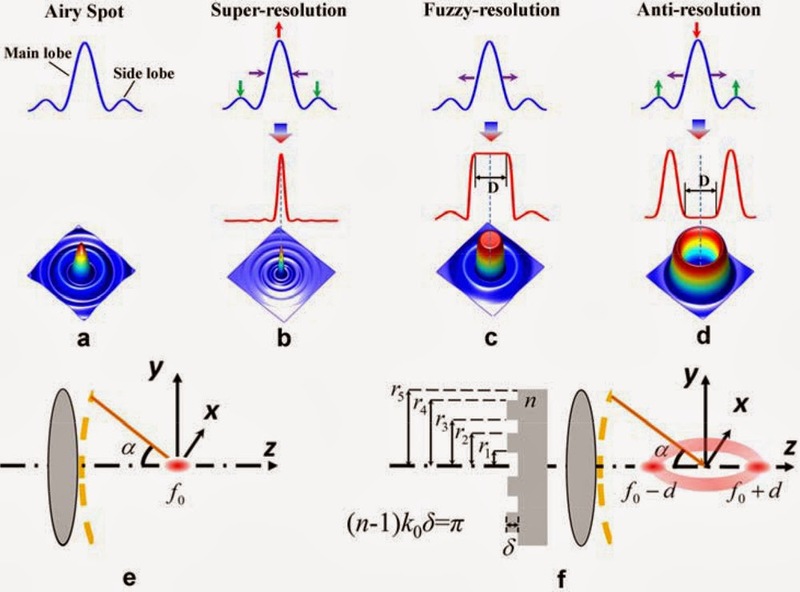 The system used to create these regions of anti-resolution is surprisingly simple, consisting of a laser, a special lens with dielectric grooves, and an imaging device. 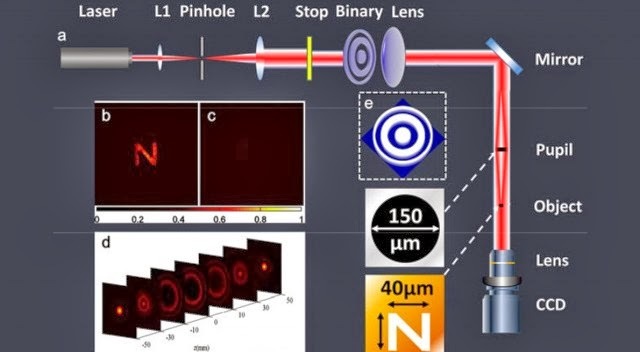 In their testing, they successfully hide a 40 micrometer three dimensional object (the letter N) from a single frequency of light (630nm red laser light). 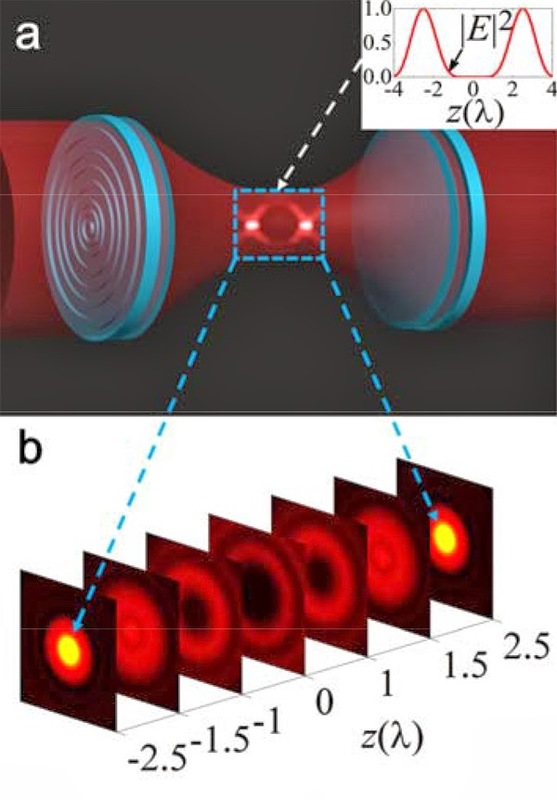 In the image at the top of the story, the N is hidden in the middle of the region shown in frame D.
A 40 micrometer object and a single frequency of light isn’t a huge deal in itself, but remember that this is the first ever demonstration of an entirely new method of bestowing invisibility on a target. The first metamaterial-based invisibility cloaks were nowhere near as good as this and they were (and continue to be) a lot more clunky than this darkness ray. It is not hard to imagine a future version of this setup an invisibility gun, if you will that lets you point at arbitrary targets to make them invisible. For now, Chao Wan and his fellow researchers are fairly certain that they’re onto something big. “This new scheme of maneuvering light creates a plethora of possibilities for optical imaging systems, superb surveillance by seeing things behind for the military use, or cloaking the object surrounded by high field intensity.” We’ll be keeping a close eye on the Singaporean researchers over the next months and years to see if they can progress beyond the micrometer scale.